Anything rice can do, quinoa can do, too, with its distinctive nutty deliciousness. 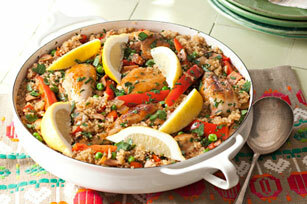 Try it in this paella with smoky ham and tender pieces of chicken. Cook chicken in large skillet sprayed with cooking spray on medium-high heat 3 min. on each side or until evenly browned. Remove from skillet; set aside. Cut half the red pepper into thin strips; chop remaining pepper. Heat dressing in same skillet on medium heat. Add paprika, chopped peppers, onions, tomatoes, garlic and 1/3 cup parsley; cook 5 min. or until peppers and onions are crisp-tender, stirring frequently. Add quinoa; cook and stir 2 min. Stir in broth. Top with chicken, red pepper strips, ham and peas; cook 5 min. Cover; simmer on medium-low heat 30 min. or until liquid is absorbed and chicken is done (165ºF), uncovering for the last 5 min. Remove skillet from heat; let stand 5 min. Top chicken mixture with remaining parsley and lemon wedges before serving. For best results, do not stir the chicken mixture, or remove the lid from the skillet, during the 30-min. chicken simmering time.